Nearly 400 people have been arrested in a major security operation in the Somali port city of Kismayo, officials there have told the BBC. African Union troops, the Somali army and a pro-government militia gained control of the strategic port last month from al-Qaeda-aligned militants. 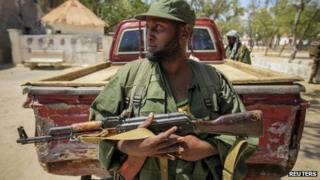 A militia spokesman told the BBC those arrested were believed to be supporters of the Islamist al-Shabab group. Since al-Shabab's withdrawal there have been frequent bombings in the city. In the latest attack on Tuesday, four civilians were killed when a bomb exploded in the town centre outside a restaurant. Abidnasir Serar, the spokesman of the Ras Kamboni militia, told the BBC Somali Service the operation began early in the morning. Residents say the city has been in complete lockdown for most of the day. Markets and schools were closed as the security forces went from place to place looking for those they suspected of supporting al-Shabab. Life in the city is very dangerous and more than 20 civilians have died since Kismayo's capture in various attacks and explosions. Al-Shabab has withdrawn from several key towns in recent months, but still controls much of the countryside. Since the overthrow of President Siad Barre in 1991, Somalia has seen clan-based warlords, Islamist militants and its neighbours all battling for control.